Ordering an item from BikeParts.com? 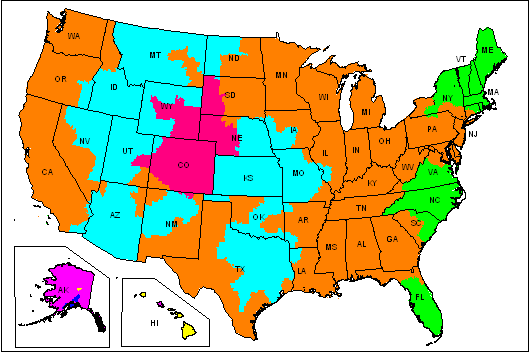 We can ship to virtually any address in the United States, Canada and some qualified countries. All orders placed by 4:00 PM EST Monday through Thursday will ship within 24 hours. Some large items and IN WAREHOUSEitems take up to 48 hours to ship. Please look at the map and shipping tables below to estimate when your products will be delivered. These tables represent how long it will take you to receive your items. Locate on the color-coded map the color zone you live in. Then reference the time and day you are placing your order in the table. You can see the corresponding delivery day. Priced at $3.95, price is determined by weight and your total order weight must be below 1lb to qualify for this method. Starting at $5.75, prices are determined by weight and/or dimensional weight, most orders ship at about $8.00. Starting at $6.40, prices are determined by weight and/or dimensional weight, most orders ship at about $8.75. Starting at $14.60, prices are determined by weight and/or dimensional weight, most orders ship at about $18.00. FedEx Ground is just as fast!